We’d love your help. 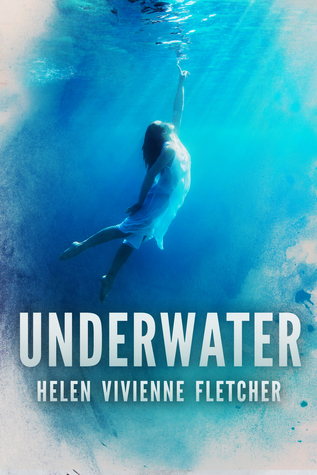 Let us know what’s wrong with this preview of Underwater by Helen Vivienne Fletcher. Bailey’s not looking to make friends, but Adam i Bailey has a lot of secrets, and a lot of scars, both of which she’d like to keep hidden. Unfortunately, Pine Hills Resort isn’t the kind of place where anyone can keep anything hidden for long. To ask other readers questions about Underwater, please sign up. Bailey has recently lost her parents to a violent crime. She and her younger sister Tilly are desperately trying to get on with their lives. Their grandmother takes them to a family resort to try to relax and forget about their problems. There Bailey meets a new group friends that will bring out the best and the worst in her. 'Underwater' is the second book I have read in recent months that takes place in New Zealand. I really love this as I don't know much about New Zealand and it's a really great setting. I also like that the location for 'Underwater' is a family resort. The resort kind of gave me a combination of a 'Dirty Dancing' and sleep away camp vibe. All the characters including Adam, Amber, Jenny, Claire, and Freya are interesting and seemed like people I would know. Even though Claire is the bad girl in the story there is something approachable and vulnerable that made me like even her. My favorite characters are Jenny and Amber. They really spice up the novel and add some diversity to it. My favorite part of the story is the slow burn romance between Bailey and Addam. Even though Adam and Bailey are not really together, the attraction and feelings they have for each other are palpable. Just something about their relationship felt special to me and told me that they had deep feelings for each other. The underlying theme of water runs throughout the novel. This really comes up in various ways in the story (the pool, the beach, the shower etc.) The water represents both Bailey's love of swimming and a symbol of how Bailey's been living her life since her parent's death. I just loved 'Underwater.' It had all the things I love in a story, subtle romance, mystery, and a bit of a slice of life. This is one of my favorite novels of the year and the reason I love reading indie books. The summary of Underwater promises "a lot of secrets," "sinister truths," and "heartbreaking love triangles." However, Amazon says that this book is 194 pages and it's even less than that on iBooks - 169 pages. I feel like the length (and the writing style in general) don't really do all the promised "dark secrets" a whole lot of justice. Most of what was revealed - with both Bailey/Tilly and Clare's backgrounds - felt pretty skimmed over and not very... satisfactory. That Summer camp gone wrong? That being said, I don't think this was a bad read or poorly written. Not at all! The overall story is all right, but, as I said before, I feel like all of the backstories and such have so much potential bigger than what it did receive. That, and I... don't really get the cover or the title? I get that Bailey, our main character, likes swimming and such, but I feel like it's not /enough/ to warrant the cover or title. ESPECIALLY the cover - which, I mean, literally shows a girl in the ocean. Judging from simply the cover alone, I almost thought that the plot would involve either 1. drowning or 2. mermaids. Moving on, because I really try not to judge a book by its cover (in most cases), I do like the sisterly relationship between Bailey and Tilly - especially given the age difference - and, overall, I actually don't mind Clare as a character, though I usually don't prefer "mean girl" villains. The representation in this book was especially cute - Amber and Jenny were great characters, and I hate that they were outed the way they were. However, while I liked their relationship, I think the actual main love triangle was a bit... weaker. It wasn't terrible as far as love triangles go (and the fact that it was two girls and a guy instead of two guys and a girl was kind of refreshing), but I feel like - as with a lot of the plot - there wasn't a whole lot of... depth to it. Like, it was there and its existence was acknowledged, but I really don't think marketing the whole "jealous ex" situation necessarily works as a proper love triangle in this particular plot. The plot, I feel, did need some spicing up - I did start to drift in some parts - but I don't think that love triangle quite did the job. Honestly, this book is kind of hard to judge and give a rating on BECAUSE of my conflicting feelings with the plot. Had the plot itself been lengthier, more in detail, I feel like the book overall could have been a pretty solid 4 star. But I also feel bad because it WASN'T bad and I would still recommend to anyone who may want a quick-read mystery, so I don't feel right giving it a low star rating. Yet an "average" (3 star) rating doesn't feel quite right either... ugh. I guess I just have to go with my gut on this one. This is a very good story suitable for young adults and older adults, like me. The story is about Bailey, a girl with many scars and wants to keep her past just that...in the past. But when she catches the eye of Adam, his ex-girlfriend Clare isn't as impressed with the new girl and becomes jealous.Clare will do her best to make Bailey look bad to everyone. I voluntarily read an ARC of this book. The review is my own opinion. A deep, unique and compelling read. Cleverly told, slowly revealing the darker backstory. Enjoyed the range of characters, and the symbolism of the boy's red shorts as the MC struggled to overcome her past. Great writing. Helen has worked in many jobs, doing everything from theatre stage management to phone counselling. She discovered her passion for writing for children and young people while wor Helen Vivienne Fletcher wrote her first novel between the ages of thirteen and sixteen. It is, by several accounts, one of the funniest novels ever written. It’s just a shame it was supposed to be a psychological thriller. Helen has worked in many jobs, doing everything from theatre stage management to phone counselling. She discovered her passion for writing for children and young people while working as a youth support worker, and now helps children find their own passion for storytelling through her business Brain Bunny Workshops, which runs creative writing holiday programmes and afterschool classes. Helen is the author of four e-picture books for children. She has won and been shortlisted for several writing competitions, including making the shortlist for the 2008 Joy Cowley Award, and in 2012 she was the recipient of the Wellington Children’s Book Association New Pacific Studios residency. Her poetry and short stories have appeared in online and print publications, and she regularly performs her spoken word pieces around Wellington. Helen has recently turned her hand to writing for the stage with her first play How to Catch a Grim Reaper, for which she was named outstanding new playwright at the 2015 Wellington Theatre Awards.